On my second visit to the Gould Bay emperor penguin colony, I flew there in a Basler DC3T aircraft, and returned to Union Glacier in a de Havilland DH6 Twin Otter. 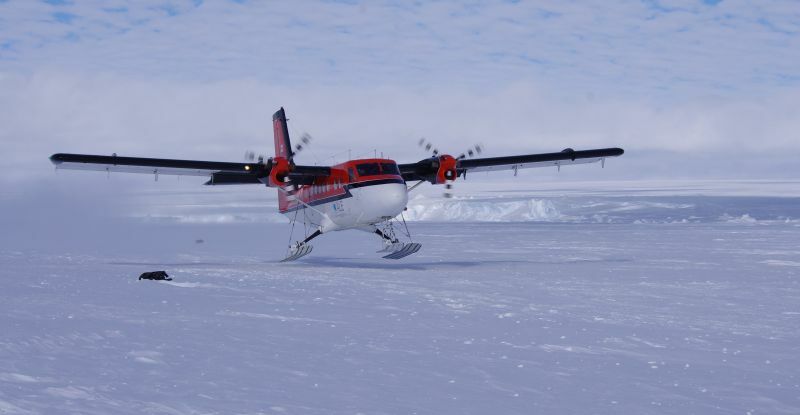 These are the predominant fixed-wing aircraft used for travel within Antarctica, and are the only aircraft used by ANI (apart from the Ilyushin-76 jet used for intercontinental travel from and to Punta Arenas). The two Twin Otters and single Basler used by ANI in 2014-15 were managed by Calgary (Canada) based Kenn Borek Air, who have provided aircraft and flight crew for ANI most years since 1986. 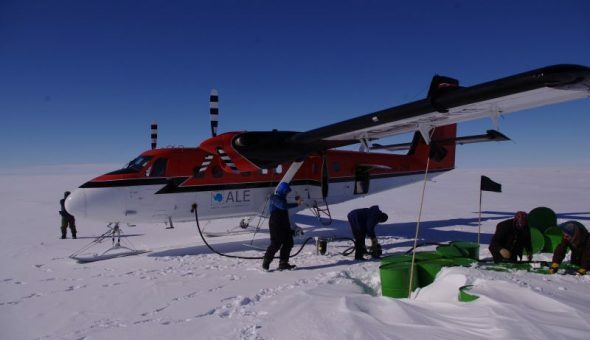 The planes are flown south on a 6 to 8-day ferry trip at the start of the season, travelling via USA, Central America and South America, before departing for Antarctica from Punta Arenas. They are used to deliver the ‘Start-up’ crew to Union Glacier, who are tasked with clearing wind-blown snow from the blue-ice runway, thereby allowing the Ilyushin to land (on wheels), delivering larger loads of cargo and up to 60 passengers per flight. The Start-up crew also get the Union Glacier camp ready to receive the first Ilyushin flight of the season, bringing about 30 ANI staff plus the cargo needed to get the entire camp ready for guests and expeditioners (e.g. those intrepid souls preparing to trek to the South Pole or climb Mt Vinson). The Twin Otters and the Basler are fitted with skis (or dual purpose wheel/skis on the Basler), and land on snow (i.e. ski-ways) at Union Glacier, at the three remote field camps (Gould Bay, Mt Vinson, South Pole), at fuel caches and other logistic sites (e.g. remote weather stations), to drop off expeditioners, and to deliver food and fuel to supported expeditions. The two main drop-off sites for people trekking to the South Pole are at Hercules Inlet and Messner (named after Reinhold Messner’s trans-Antarctic start point in 1989). Both sites are in the middle of a featureless ice-shelf, just beyond the theoretical coastline of Antarctica, if the ice was removed. Hercules Inlet is closer to Union Glacier, and so is a cheaper start point to get to. Messner is closer to the South Pole, saving 2-3 weeks of walking or skiing. 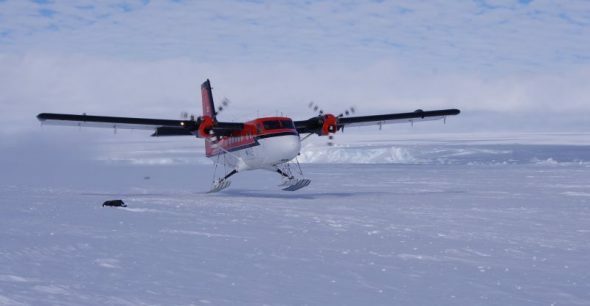 Twin Otters are twin-engined planes that can take up to 18 passengers if used solely for this purpose, but in Antarctica are typically configured to carry up to 9 passengers and 300 kg of cargo, much of which is stowed between the passengers and the cockpit. The Basler conversion is immediately recognisable from its classic lines as being derived from a 1940s-style Douglas DC3. The DC3 was the world’s first airliner; a cargo and passenger aircraft that was designed in 1935 and used extensively for military and civilian roles. The Basler name is from the Oshkosh, Wisconsin-based company that takes a DC3 airframe and modifies it by replacing the original radial piston engines with much lighter turbo-prop engines (Pratt & Whitney PT-76). Additional modifications include extending the forward fuselage by a metre to compensate for the weight imbalance of the lighter engines, thereby creating a 35% volume increase in cabin space; the wings have been extended and reshaped at the tips, increasing the wingspan by approximately 2 metres, making the aircraft easier to control at low airspeeds; and the addition of modern avionics and electronics. The ‘ANI’ Basler was originally manufactured in California in 1942, and was modified in 2009. It can seat 18 passengers (but could seat 28 if configured for passengers only), and has a longer range than the Twin Otters (2500 km cf. 1300 km on a typical long-range, one-way flight with reduced payload). On longer flights the planes can land and refuel at fuel caches established by ANI. The remote caches are very expensive to establish and maintain, requiring air-drops of fuel drums from the Ilyushin, delivery of a few drums at a time by the smaller aircraft, or multi-day overland (or more accurately over-ice) traverses by snow-tractors towing sleds laden with drums. 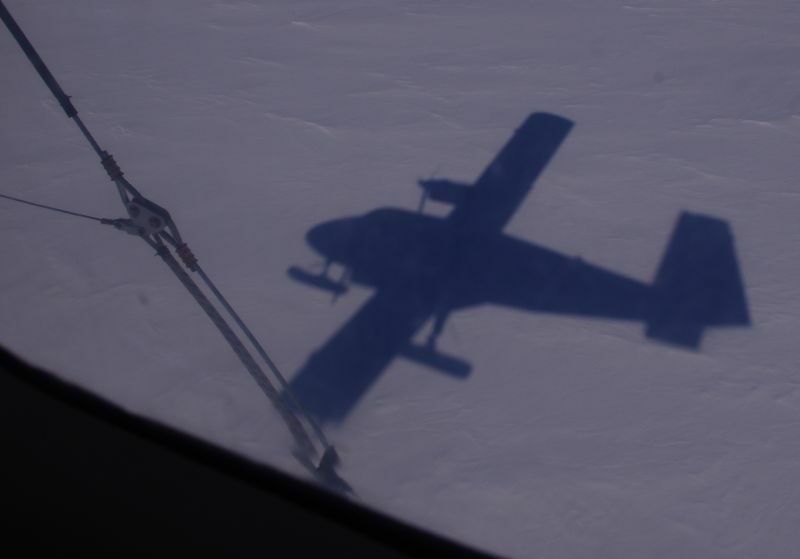 For most of the season there were ten Kenn Borek Air crew at Union Glacier and its three remote camps, with three crew per Twin Otter, and four on the Basler. The KBA crews are very much part of the ANI team, especially at the remote camps, where all hands contribute to camp life. When we were at Gould Bay, there was always at least one aircraft parked alongside, meaning 3-7 extra personnel in the camp. This is a precaution in the event of a medical emergency, or if the sea-ice starts to break out, and personnel need to be evacuated rapidly from the camp (which was situated over 300 metres of sea-water). At the start of my second visit to Gould Bay, there were 31 people in camp, comprised of 16 guests, 8 ANI staff and 7 KBA crew. It was rather crowded in the dining tent, which comfortably sits about 15. There was more room after the first two nights, when 15 people departed, as half the guests were on an ‘Emperors & Explorers’ experience, with a shorter stay at the penguin colony followed by a day trip to the South Pole. Most of the rest of us departed after 4 nights, leaving only the camp manager and assistant manager there – they were on site for the entire 4 week Gould Bay season. The flights between Union Glacier and Gould Bay are 3 to 4.5 hours in duration, depending on whether they are direct, or via the South Berkner fuel cache, which adds 80 km to the trip plus refueling time. The only scenery to be seen is at either end – the Ellsworth Mountains surrounding Union Glacier, and the edge of the Ronne Ice Shelf, including tabular icebergs, at Gould Bay. In between is the featureless flat ice of the Ronne Ice Shelf, which is remarkably like flying over solid cloud. 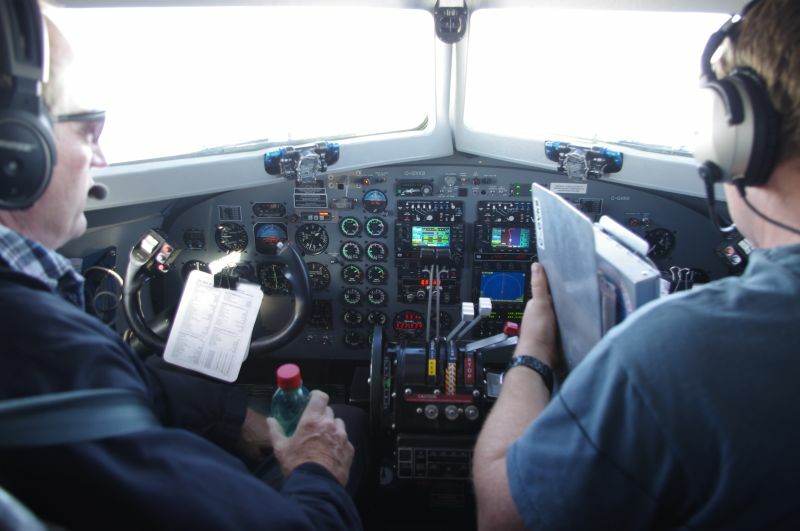 It is a good opportunity to write lengthy blogs such as this one, which was appropriately penned in the rear seat of a Twin Otter, finalised back at Union Glacier, and published when I returned to New Zealand. Te Papa vertebrate curator Dr Colin Miskelly visited Antarctica during November-December 2014 as a guest lecturer for Adventure Network International (ANI). 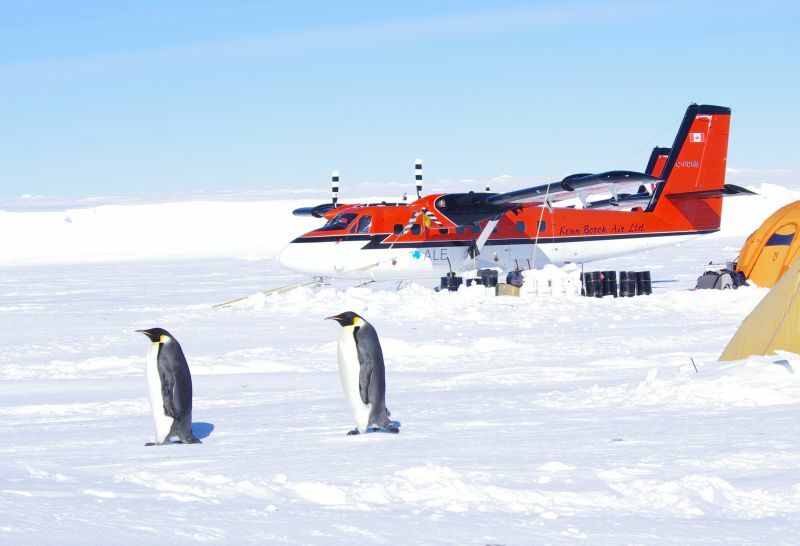 This is the sixth in a series of blogs based on his experiences in Antarctica, and particularly at the Gould Bay emperor penguin colony in the southern Weddell Sea.